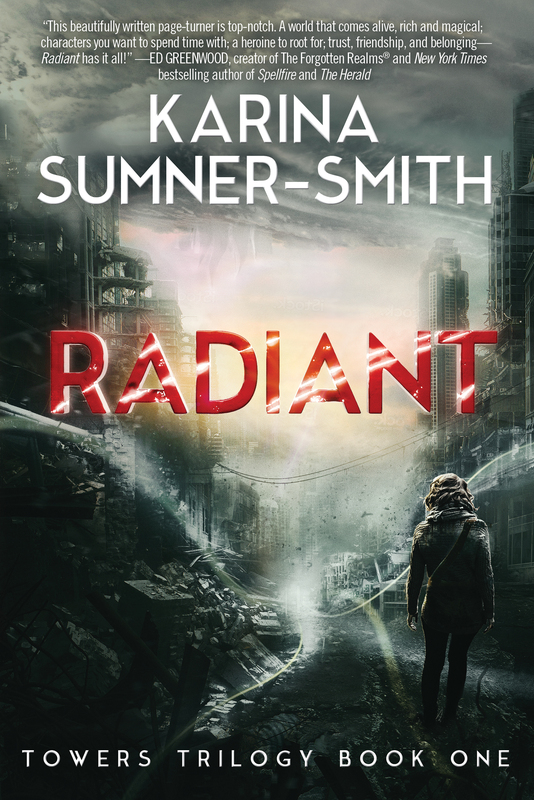 Karina Sumner-Smith is joining us today with her novel Radiant. Here’s the publisher’s description. Shortly after finishing Radiant, I came across an article that explained the “right” way to bring a debut novel into the world. 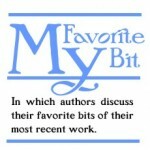 Among other things, it recommended that you understand your genre classifications in detail and where the book will fit, know the book’s audience right from page one, and to think ahead to how you or your publisher might market the novel. Hmm, I thought. That’s kind of the opposite of what I did. Oops? See, when I sat down to write Radiant, maybe I should have been thinking about the future – but at the time I was just having a blast. As a result, I have a book that seems to slip between genre classifications, rich with things that delight me: ghosts and spells and sarcastic banter, crumbling urban ruins with creatures that stalk the streets when night falls, a floating city with an economy that runs on magic, and the development of a powerful friendship between two very different young women caught in strange circumstances. But if I’m being honest what I love most of all is the book’s ending. Sometimes I think writers make the mistake of conflating their experience writing a story with the audience’s experience in reading it – for good or ill. And yes, working on those final few chapters was probably one of the happiest writing experiences I’ve yet had: the words rushing out as characters fought, and things went wrong, and great forces came together in those final, explosive scenes. Yet throughout the revision and editing processes, as I read the book again and again (and again … and again …), I realized that, if anything, I liked that ending more with every read-through. Xhea, the main character, is a homeless young woman from the very bottom of her society – literally. There is the City, made of floating Towers that battle for altitude across the sky; there is the Lower City, huddled in the ruins on the ground below; and then there is Xhea, who lives in the abandoned subway tunnels and shopping corridors that wind beneath the Lower City. In a world that runs entirely on magic, she has no magic at all – no place, no way to participate, nothing. Most people think her useless, little more than a parasite; Xhea’s too busy surviving to argue. Yet there comes a point in the story where Xhea is trapped, alone and abandoned and in her enemies’ hands. She can find no way out; no strength, even, to try. It’s only when she realizes that her only friend in the world needs her help that she manages to stand up and fight back. This person who others dismiss as selfish and useless is transformed not by serving her own interests, but by risking everything for someone else. You could say that my favorite part of Radiant is Xhea herself; you could say it’s her slow and difficult process of breaking down emotional walls and learning to trust another person. You could say it’s the cool magic, or the ghosts, or the world in which it’s all set. But in truth, it’s just a single moment: the moment that a difficult, hurting, determined young woman truly comes into her own. And after that … well, then things really get fun. What can I say, I love a good explosion. Karina Sumner-Smith is a Canadian fantasy author. 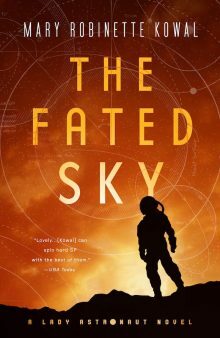 Her debut novel, Radiant, will be published by Talos/Skyhorse in September 2014, with the second and third books in the trilogy following in 2015. Prior to focusing on novel-length work, Karina published a range of fantasy, science fiction and horror short stories, including Nebula Award nominated story “An End to All Things,” and ultra short story “When the Zombies Win,” which appeared in two Best of the Year anthologies. Though she still thinks of Toronto as her home, Karina now lives in a small, lakefront community in rural Ontario, where she may be found lost in a book, dancing in the kitchen, or planning her next great adventure. Reading Karina’s bit about the ending makes me all the more excited to read this book when it comes out. Her enthusiasm and passion shines through her words there. Plus, I know the “Oops” feeling she talked about. I sort of skipped that “thinking about the future” stage when I first started working on my WIP, and am playing catch-up now.